Racism in the U.K. is nothing new. 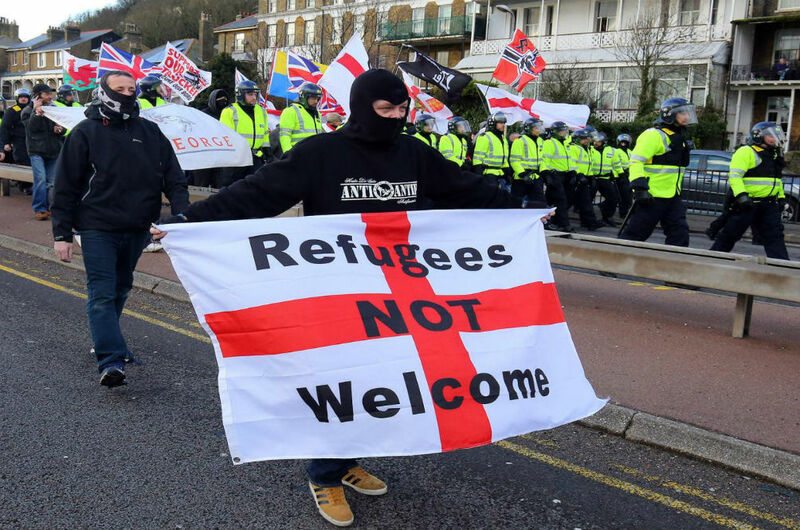 Different groups have suffered persecution and vilification since before the Anglo-Saxons first docked on some lonely English coast way back when. The recent rise in hate crimes, as reported by the Office for National Statistics, and the rise of public Islamophobia, does show something entirely new however: Britain is becoming hysterical. For a nation that prides itself on cool heads, fair play and a stoic sense of bearing up, there is rather a lot of poisonous emotion currently floating in the air. Take professional troll, Katie Hopkins, for example. In a recent tweet she derided the teenage victims of the school shooting at Marjory Stoneman Douglas High School, Florida, as kids who were ‚just crying because they’d been shot at‘, and therefore, didn’t deserve to have any say on public policy around guns. Katie Hopkins also frequently tells her audiences that Britain needs to defend itself against Muslims, because British (read: white) children are vulnerable. So children are OK to be shot at by an American (read: white) killer, but they are completely vulnerable when it comes to potential Islamist killers. Why the sudden change in standards, Katie? The point is, U.K. racism is beginning to spin out of control. It’s riding a wave of emotion that is based on the false perception that the lives of white people are under threat, simply by the existence, or coexistence of Muslims, and other dark-skinned people. People simply don’t see, or are choosing not to see, the basic flaws in their thinking. They might retort ‚well, Islam is not a race, therefore it’s OK to criticise it and it’s not racist to do so‘. Sure, it’s not racist to criticise a religion – agreed. But when criticism of that religion is leveraged to help create hate against minorities, particularly ethnic minorities, then we can say it’s at least helping to foment racism. I would go much farther of course and call it for what it is: racist, racist, racist. No one’s lives are under attack. No one’s lifestyles are threatened. Nothing is happening. These messages won’t get through to the racist elements in the British public, because they feel a wave of support. They’re being backed by ordinary British people more and more, who are turning to simpler answers in more complex times. International threats? Blame the Muslims. A lack of expertise on the Brexit negotiating team? Get behind the nation or get out. Potential conflict with Russia? The real threat is Islam! The truth is, there is money to be made from hate. Katie Hopkins, Tommy Robinson, Nigel Farage, UKIP, Donald Trump, AfD, the Identitarians and others know it. You can sell anything you want to a gullible public who are eager to subscribe to anything intelligible. Not only do we, as anti-racists and anti-Islamophobes, need to stand up and protest this vicious rise in hate, we also need to speak clearer and louder about how ridiculous, how absurd, how contradictory hate is. It will lose, it must lose, because it is weak, and it knows it. On Saturday 24 March, Birmingham UK will be home to the UK’s largest ever Islamophobic gathering. Stand up to Racism will also be there – get to their protest.